Hot Jupiters are weird and lonely little planets. Well, they’re huge. But otherwise: They’re weird in that they surprised astronomers when we started finding them, giant planets orbiting improbably close in to their stars, as close as 0.015 AU from their stars. (Earth, remember, orbits at 1 AU. Mercury’s at 0.307.) Their presence there clashed with all our ideas about planet formation, modeled on our own solar system. According to current theories of planet formation, there’s not nearly enough material close to a star to form a planet of Jupiter-ish size. But current theories of planet formation also allow for migration, so there you go—hot Jupiters could have formed farther out from their stars, where raw materials are plentiful, and then later they can migrate in. Complicating the picture, though, is the fact that hot Jupiters are usually found alone. Small, low-mass planets are common enough in the close orbits that hot Jupiters frequent, except when a hot Jupiter is there. On the migration end of things, there are, broadly speaking, two possible explanations for hot Jupiters’ positions: Type II migration during planet-formation, moving inward through the gas-rich protoplanetary disk; or, later on, once planets have formed, through gravitational scattering as a giant planet in an eccentric orbit interacts with small planets closer in to the star. But Type II migration doesn’t explain hot Jupiters’ lonely neighborhoods—that migration would happen early enough to leave plenty of planet-forming material undisturbed in its wake. Hot Jupiters’ lack of nearby companions could, of course, be explained by other means, but today’s paper tests the idea that hot Jupiters could be killing two birds with one migrational stone: could late migration via gravitational interactions bring hot Jupiters into their tight orbits while also getting rid of any small, close-in companion planets? The authors of this paper tested a series of scenarios that are a mix of known circumstance and hypothetical orchestration. They chose four real-world Kepler candidate systems of three low-mass, close-in planets, and added to the mix an imaginary Jupiter on an eccentric orbit with a small pericenter (meaning that on its closest approach to the star, it came very close). For each system-plus-Jupiter, the authors calculated a suite of simulations, each time testing slightly different properties for the giant planet (pericenters ranging from 0.01 AU to 0.25 AU, prograde and retrograde orbits) as well as variations in the small planets’ orbital inclinations. Even with all of those variations, most of the simulations ended in one of two scenarios as the giant planet migrated in from an eccentric orbit toward a nearly circular one very close to the star: either the low-mass planets were destroyed and the hot Jupiter was left alone, or the giant planet was ejected and one to three low-mass planets were left behind. (In both cases, low-mass planets could be lost by collisions with the star, each other, or the giant planet itself. It’s worth noting that the giant planet’s eccentric orbit often crossed the paths of the orbits of the other planets.) Basically, if a giant planet migrates in to a tight enough orbit to be called a hot Jupiter, it will, in the process, get rid of any other tight-orbit planets. If a giant planet doesn’t eject or destroy those other planets, it won’t become a hot Jupiter. 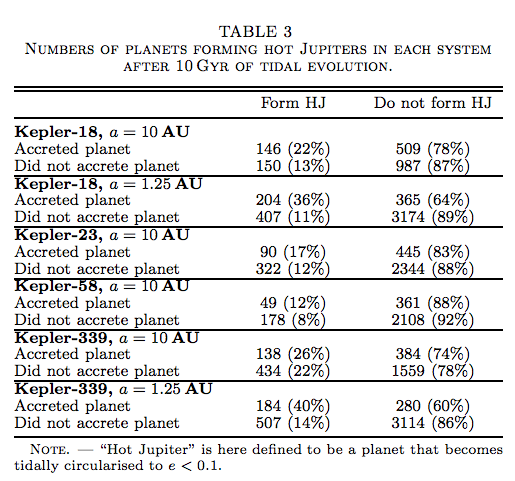 Most giant planets in the simulation don’t end up in narrow enough orbits to become true “hot Jupiters.” If a giant planet accreted one or more of the inner planets in its migration, it was more likely to become a hot Jupiter, although those interactions were relatively rare. 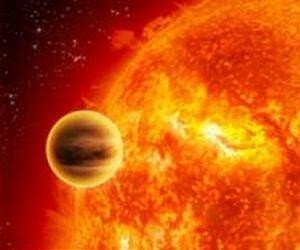 The mysteries of hot Jupiters are by no means all settled. This is just one proposition, and even at that, it starts with the giant planet in an eccentric orbit, not testing the plausibility of the starting conditions (although they are implied by earlier research). The more we learn about exoplanet systems, the more the diversity of the cosmos and perhaps our own solar system’s weirdness become apparent. It is known how long such migration mechanisms take or how long after planet formation it takes the Hot Jupiter to find its location close to the star? Also, what stabilizes the Jupiter in its final orbit? It would seem to me that if its migrating inwards it would spiral into the star eventually, what prevents it from doing so or is it in fact doing this just on a long timescale? Have similar simulations been done to test the plausibility of type II migration? You mention that such migration wouldn’t explain the lack of other planets, as it wouldn’t clear out the material out of which they form, but it seems like having a massive planet move through the area in which it’s forming might somehow impede smaller planets’ formation. Is it a hard and fast requirement that to be a hot Jupiter, there can be no other low mass stars present? What about low mass stars that orbit outside the orbit of the hot Jupiter? When we say that the low mass planets are “destroyed,” what does that mean? Are they broken up through collisions? How common are interactions such as these? Do many systems have potential Hot Jupiters that end up getting ejected or do most potential ones end up becoming hot Jupiters? Given the perceived weirdness, I imagine they’re not incredibly common. Are there any groups exploring the possibility that the existence of hot Jupiters disproves our current model of planet formation, i.e. is anyone looking for contrary models that allow for a large amount of material near the star? Such a model would allow the hot Jupiter to form in situ and not necessity migration over large distances. How certain are we that these exoplanet systems don’t have any smaller planets accompanying them? The most common way of finding exoplanets (to my knowledge) is through light curves, and a smaller planet may not have enough of a gravitational pull on the star to become apparent in a light curve, especially in relation to something like a hot Jupiter in the same system. It’s interesting to see models for how these lone Jupiters could arise, but how common they seem to be is likely due to a selection bias in the way we find exoplanets. I’ve heard of one theory that supports scattering involves the existence of many gravitationally unbound planets due to a Jupiter ejecting another planet out of the system in order to migrate in (a sort of energy conservation at work). I wonder if any of these planets have been found, there ought to be tons of them. My question is similar to George’s above — how likely it is it that hot Jupiters aren’t actually so lonely given our observational/instrumental constraints? Additionally, how have our models of various planetary phenomena changed since we started to observe many more planets outside our solar system? Very interesting post! Just to make sure I understood it right: hot jupiters are very big planets that come very close to the sun during a period of their orbit, right? I mean, they have a very eliptical orbit, so is it not that their orbit becomes smaller when they migrate? No, they orbit all the time very close. Their orbits might be elliptical as well, but most of them are really on extremely close orbits to the corresponding host star. Neat post! Could these same migration effects work to bring exoplanets from far away in after a star has died? You can thank Saturn for saving our bacon. Jupiter did indeed migrate in (which is why Mars is small – Jupiter ate its lunch, so to speak), but Saturn tugged Jupiter back out into its current orbit.